Details and Registration can be found Here! What's a typical day of camp like? Camp runs 9:30-1:00 (extended care is available until 2pm). 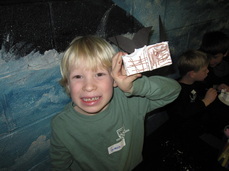 Every day of camp is full of different activities as we focus on diverse themes which explore the ocean in fun ways. Camp starts off with open free-time in our workshop room, followed by the day's set activities, which usually include touching objects and artifacts from the collection, playing active tag games, creative art-making, and highly hands-on exploration stations. We sometimes break into small groups for set station activities that children rotate through. We have a snack break (which we'll happily supply - often juice and a pretzel party mix) as well as a lunch break (bring lunch and a water bottle with you). Sometimes we have live animals visit too, and when good weather/low tide match up, we take a special trip to the shore (we'll let you know when this is planned)! Camp ends as kids complete an art activity to take home. Camp is lead by our Education Department's seasoned educators. All of our instructors are either state-certified to teach or are pursuing certification (read about us on the About Us page), which includes fingerprinting and NY State background checks. Assistant instructors are background checked as well. We normally have an adult-child ratio of 1:7 or better; young camp assistants, who are volunteers, are often present, especially when we have a large group signed up. We would be happy to extend your child's camp experience until 2 pm (regular pickup is 1 pm). After finishing lunch, we play group games and have fun with additional crafts. We may play games outside if the weather is pleasant. The cost for the Extended Hour is only $10 for members and $13 for non members. Sibling discounts do not apply to this extended hour. Please note this extended hour is subject to a minimum number of students; if you are interested, please let us know ahead of time so we can arrange proper staffing. We're thinking of signing up for a membership - can we do that at the same time we sign up for camp? Yes - just scroll down to the bottom of this page and add a membership to your cart, and we'll take care of the rest. More information about membership levels and benefits can be found on our Membership page. How does the sibling discount work? What is a Crew Leader? What is a CIT? Crew Leaders are normally entering 4-5th grades who come to camp to both have fun and assist our instructors. Leaders take a leadership role during the learning games we play, help us pass out supplies during activities, and help keep camp moving smoothly. They partake in all the activities and crafts. The cost for a Crew Leader to attend camp is discounted to $25 a day for members and $30 for non-members. CITs are entering grades 7+. They gain valuable experience and volunteer hours. Like their names imply, they are Counselors in Training! They assist our instructors with keeping activities running smoothly. While we encourage CITs to of course have fun, we expect them to behave professionally, responsibly, and courteously at all times. There is no cost for a CIT to attend camp. We ask for at least 5 days of service (1 week) for the summer season. Membership fees are not refundable. If you are unhappy with your membership, please contact our director here. If your child’s registration is cancelled two months (60 days) before the start of camp, a refund will be issued, minus a 25% administrative fee per child (with a maximum of $25 administrative fee per child). If the registration is canceled less than two months before the start, the refund of the deposit is subject to our ability to fill your child’s space by 12pm the weekday before, minus a 25% administrative fee per child (with a maximum of $25 administrative fee per child). If a camper misses camp due to illness, you have two options: Option 1: The Museum will refund 75% of your fees, prorated for the number of unattended days (please understand we have arranged for staffing and materials for your child). Option 2: You may put 100% of the camp fees towards a future camp session at the museum taking place in the next 6 months (we run camp December break, February Break, April Break, and throughout July/August). For either option, the Museum must be notified within 24 hours of illness and a dated doctor’s note must be provided within one week for refund. 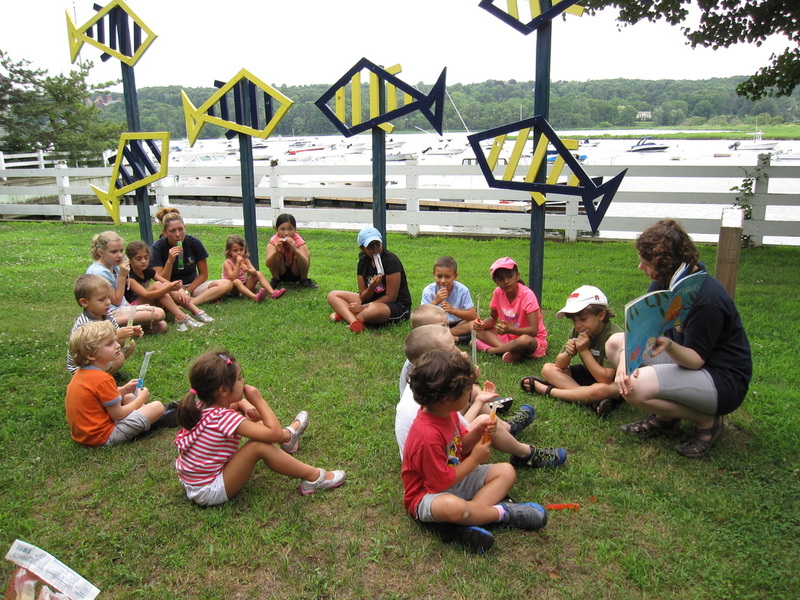 If you have questions about what camp is like, give our educators a call at 631-367-3418 ext. 15 or 16 from 10am-5pm (though please note that all signups are online). If you have questions about your registration or payment, please contact our Business Manager, Katie Kelly at 631-367-3418 x10 from 10-5 pm. June & July 2013 Highlights here. June 2012 Session pictures here. July 2012 Session pictures here. Pirate & Mermaid Session here. April Registration: limited space available for friday 4/18 - continue registration below. For Summer Registration: Click Here. Please scroll down within the box below. going on to the next step! Curious about member benefits? Find out here! Don't forget to bring LUNCH and a WATER BOTTLE!